"Anyone who's played golf in Japan will know that many clubs have two greens on each hole"
Fred Varcoe wrote about putting greens on Japanese golf courses in the August 2016 issue of Euro Biz Japan. 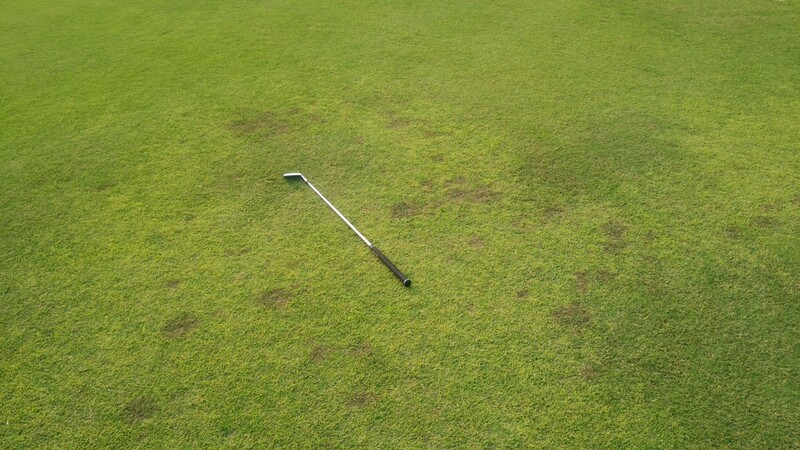 The article, Know your greens (pdf, 3 MB), includes some quotes from me about bentgrass, korai, and how balls roll on putting greens. And kind of on this same topic, but of more general interest, see Paul Jansen's post on The Japanese Golf Experience. You'll see more than just grass: breakfast beer, tiny hotel rooms, hot springs, cold springs, blue balls, green tea, and a volcanic eruption. 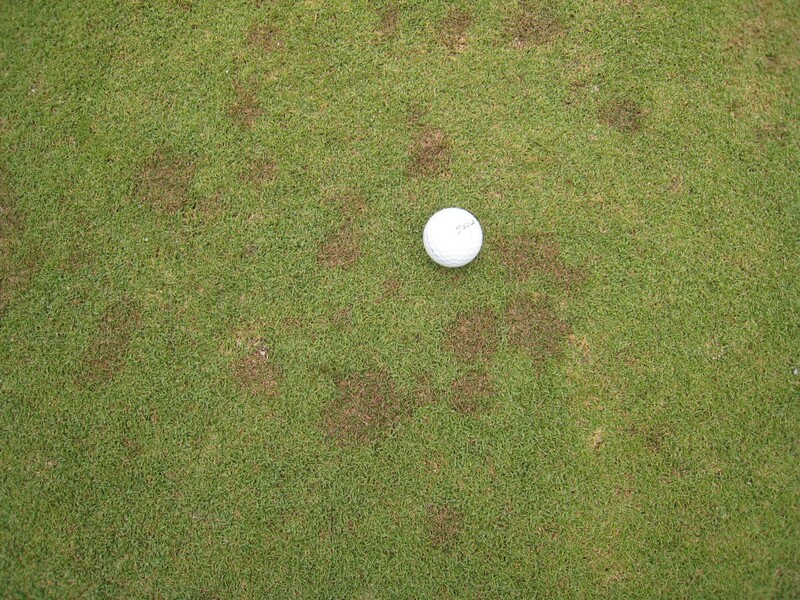 I gave a seminar in July in which I discussed how much one can expect grass to grow. I said something like "grass can always grow more, but turfgrass managers restrict the growth rate by supplying less nitrogen fertilizer than the grass can use. 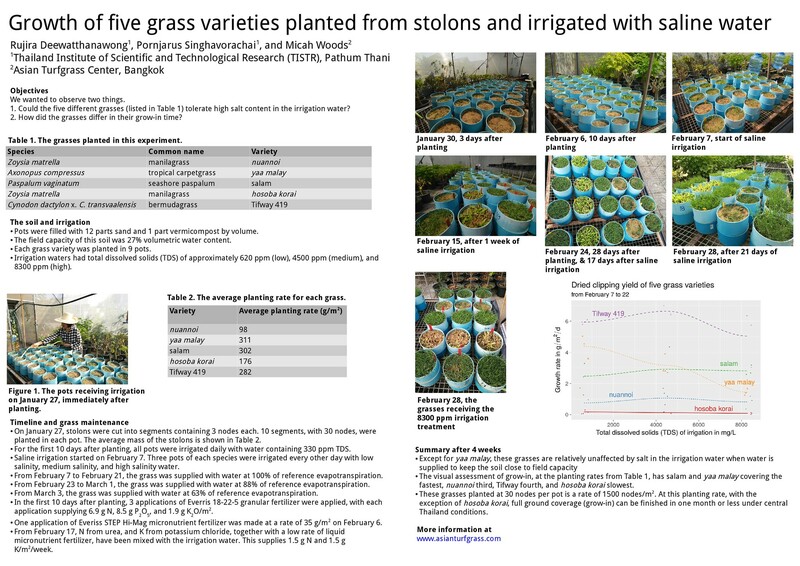 For example, I could apply 100 g/m2 of 10-10-10, and the grass would grow more rapidly than if I applied only 10 g/m2." Someone in the audience disagreed with me. "You can't apply 100 g/m2 of 10-10-10," he said. "That much will burn the grass." I wondered about that, so I went shopping for 10-10-10. I didn't find a 10-10-10 with suitable particle size. 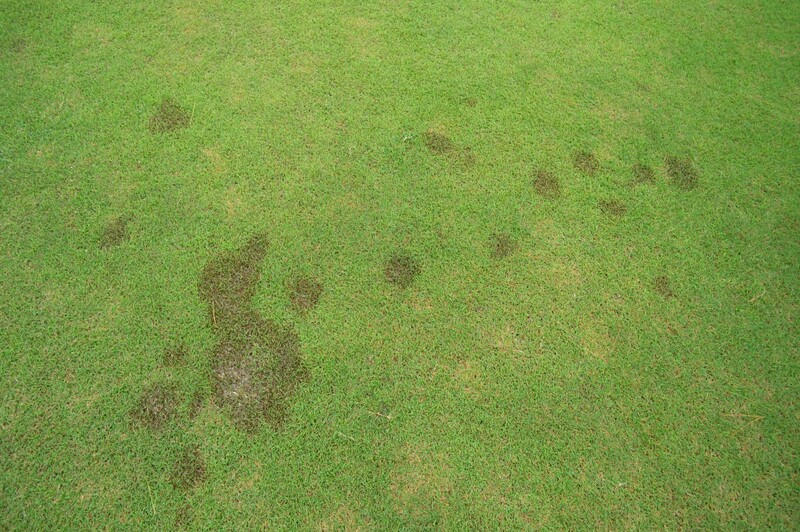 The closest analysis with a particle size suitable for application to turfgrass was 14-14-14. I bought a bag. 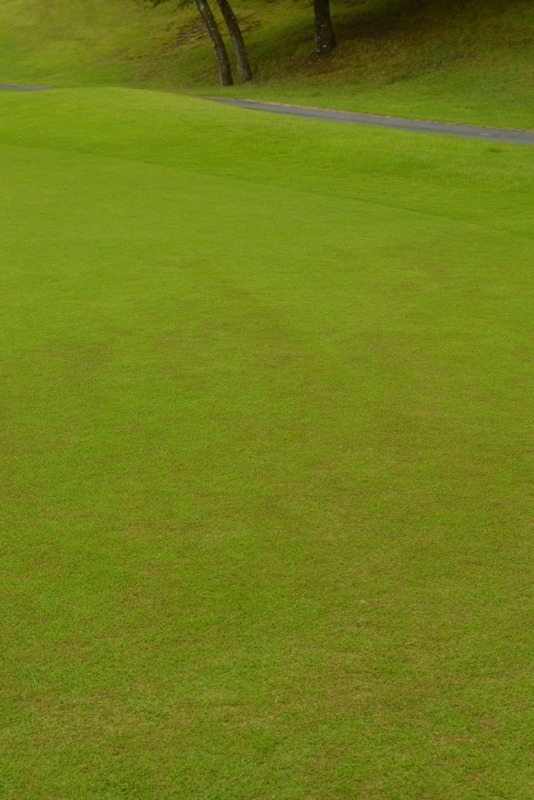 Then I marked out plots on a korai (Zoysia matrella) nursery. Each plot was 1 m by 1 m, and there were seven plots in total. This is what the plots looked like right after the fertilizer application, before turning on the irrigation, on 31 July 2016. I had measured out the 14-14-14 fertilizer and applied it to these plots. One plot received no fertilizer, and the other plots had 14-14-14 applied at rates from 2.5 up to 15 g N/m2 in 2.5 g increments (that's an N rate of 0 to 3 lbs N/1000 ft2 in 0.5 pound increments). This is what the plot receiving the 15 g N/m2 rate looked like after I spread the fertilizer and before irrigation was applied. I wanted to check three things with these fertilizer treatments. First, I wanted to see if this much fast release fertilizer would burn the grass. In the seminar, I'd said that 100 g/m2 of 10-10-10 could be applied, but no one would do that, because it would make the grass grow too fast. In this test with 14-14-14, I included N rates all the way up to 15 g/m2, equivalent to 150 g/m2 of 10-10-10. Second, I wondered what would happen with root growth at different rates of fertilizer. Third, I wondered how long a color or growth response would last. 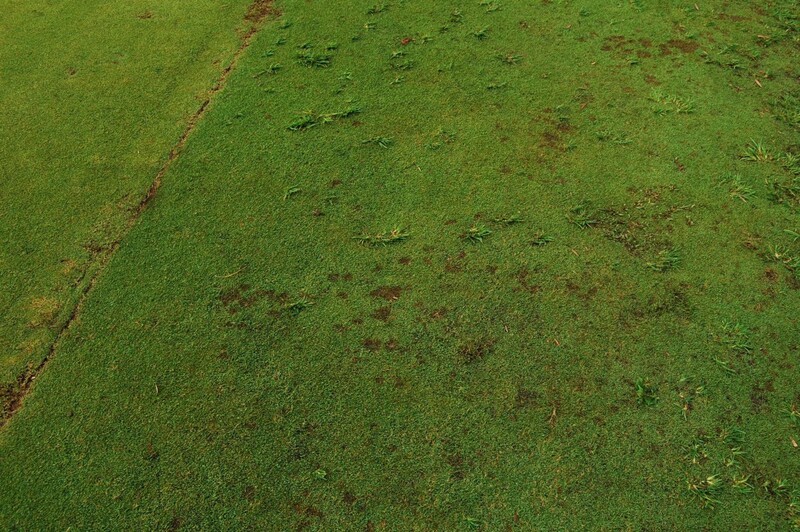 For example, when the grass starts going dormant in the autumn, would the effects of a 31 July fertilizer application still be visible? Before I applied the fertilizer, the roots were like this. These roots are from the plot receiving the highest rate of 14-14-14, before any fertilizer was applied. The fertilizer was watered in and there was no burn. Maybe just a little bit where a few particles didn't dissolve completely, but the overall effect was to make the grass greener. A week after the fertilizer application, the plots looked like this. In the foreground is the plot with no 14-14-14 applied, and each plot after that received an increasing 2.5 g N/m2 increment of 14-14-14. This plot received 15 g N/m2. A week after the application, it was greener than the surrounding grass that didn't receive fertilizer. If there was any burn, one might pick out a few leaves here. They didn't last long. I came back a month later and had a look at the plots on 30 August. I also looked at the roots for each of the fertilizer treatments. I had expected that adding some 14-14-14 would cause an increase in roots. All the plots showed an increase in roots by 30 August compared to the roots I looked at on 31 July. But I don't see any increase in roots with fertilizer application. If anything, the root system was largest in the control plot that received no fertilizer. 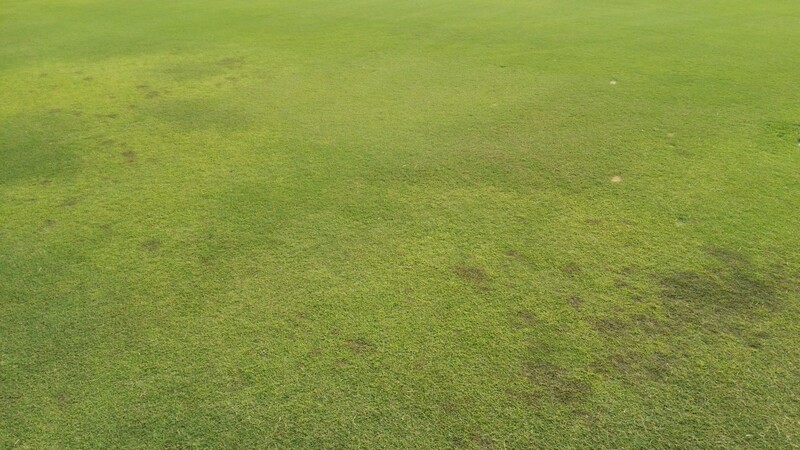 The soil on this nursery is similar to the soil on the course. The nursery soil wasn't tested, but the course soil was, and in May 2016 the median pH was 6.4. Using the Mehlich 3 extractant, the mean K, P, Ca, and Mg were 59, 172, 1304, and 57 ppm. All these elements were present at adequate amounts in the soil, so adding more K and P in the 14-14-14 didn't make the roots grow more. I had expected more N (up to a point) would cause an increase in root growth, but after one month, that's not apparent at all.